I spent the day with my family at the Big E today. I was in boy mode, though my heart was in girl mode. Not much to report trans-wise except for the sighting of a woman with a very visible five o'clock shadow showing through her make-up. Too bad because she was attractive sans the beard. I have been on vacation this week and have been watching more late night television that is normally past my bed time when I am working. I particularly like Jimmy Fallon's show. I don't know if the "Lip Sync Battle" is a regular feature of his show, but I really enjoyed the Wednesday night Lip Sync Battle between Fallon, Stephen Merchant, and Joseph Gordon-Levitt. I just found a video of that Lip Sync Battle and I am passing the link on to you for your enjoyment. The other great foundation faux-pas is the visible tidemark on the neck, seen that plenty. 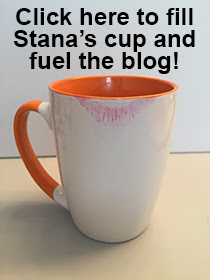 Thank you, Stana, and I hope your weekend is also a good one! So Awesome! So Stana worthy! The female dub of that clip made it entertaining, especially the nicki minaj (he really got into it). If I didn't have so many shows in my DVR (already feel glued to my TV) I'd totally watch fallon more. His timberlake tuesdays are incredible.